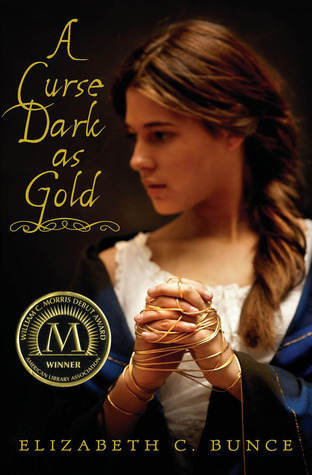 If you, like me, are hard-pressed to find truly chilling gothic fiction, then A Curse Dark as Gold is not one to pass up. As a re-telling of “Rumplestiltskin,” this novel is haunting, poetic, and – most importantly – whole. Out of all the fairy tales in the world, “Rumplestiltskin” is easily my least favorite. After all, who really wants to read the story of a nameless heroine who later betrays the only character who helps her and winds up marrying the man who threatened to ruin her? It simply doesn’t make for good literature and, moreover, there is something grotesque about the dark underbelly of human nature that it manages to expose. With A Curse Dark as Gold, however, Bunce has taken this flawed – and largely unlikable – tale and crafted it into a believable story, one full of human flaws, but also realistic virtues. A Curse Dark as Gold is, as many readers will undoubtedly rush to admit, slow. And yet, it is never cumbersome. Bunce’s writing is beautiful and as she builds for us the mythical village of Shearing, she also slowly writes the creeping tale of ill luck and curses that have followed the Miller family for ages. Charlotte and Rosie, the two sisters of Stirwaters, are orphaned when this novel begins, but quickly take up the difficult mantle of running their late father’s business. As can be expected, a slew of new changes is in store for them, from their little-seen Uncle Wheeler making an appearance to the discovery of thousands of pounds of debt their father hasn’t paid and – my favorite – the introduction of Randall Woodstone, a banker. As Bunce throws multiple hurdles at these two sisters, she also peels back the layers of rumors and superstitions that surround Stirwaters and the Miller family. One of the only reasons this novel excels is because of Charlotte. Not only is Charlotte a headstrong, self-sufficient, and reliable heroine – one who doesn’t shirk responsibility and embraces hard work – but she’s also extremely pragmatic. Charlotte refuses to believe in the Curse of Stirwaters, meeting challenge after challenge with a clear mind. And yet, as this novel progresses, as misfortune presses down upon her, Charlotte slowly begins to fall back upon the hidden mysteries of her home that she has refused to acknowledge. Where Bunce truly shines in her portrayal of Charlotte is in displaying the dual nature of her personality. Every trait of Charlotte’s that is one to be applauded – her stubborn nature, her commitment to the mill, her loyalty to her family – are all slowly spun in such a way to become her downfall and revealed to truly be flaws. A Curse Dark as Gold is, as I mentioned earlier, a very slow, creeping read, one that builds its gothic atmosphere as the curse becomes more and more actualized in our minds. As Bunce writes this atmosphere, though, she perfectly captures its effects upon her protagonist, rendering her a far more three-dimensional character than the nameless heroine she was originally based off of. Bunce continues to strengthen the original tale of “Rumplestiltskin” through her interpretation of the dwarf himself. Jack Spinner, a mysterious man who appears whenever Charlotte and Stirwaters are nearing their ends, is one of the best villains I’ve come across. I am relieved to announce that Bunce does, in fact, tie-up all loose ends concerning Spinner’s character by the end of the novel, and she does so brilliantly, instilling a level of history, sorrow, and depth to a villain we formerly may have thought to be forgettable. And yet, what makes Spinner such a brilliant character is his ability to bring out the worst in the best people. I love that Bunce took an innocuous device from “Rumplestiltskin” – the dwarf’s ability to prey upon helpless individuals, gradually increasing his payments and forcing their own hand at evil to stop him – and brought it to life, even more encompassing than before, to drive home the extent of gray matter that exists within everyone’s hearts. Nevertheless, A Curse Dark as Gold would fall seriously short of its mark of brilliance without its cast of secondary characters. First and foremost, the village of Shearing is a force to be reckoned with. Bunce makes this fictional environment come to life, with her accurate descriptions of the Industrial Age – how I love a well-written historical fiction novel – in England and her lyrical prose. More than that, though, her vision of Stirwaters – a mill that provides for the livelihood of an entire village – is given breath and air as these workers become just as dear to us as they are to Charlotte. Stirwaters, not to be outdone by Shearing, comes with its own ghostly atmosphere, from hexes that refuse to be erased to equipment that won’t work without the presence of a charm to ward off evil nearby. Its owners, Charlotte and Rosie, are family that worm their way into your heart. Rosie, though lacking the extent of responsibility that Charlotte faces, is no less admirable, courageous, and intelligent. I particularly loved watching the relationship arc between these siblings, from their arguments to small gestures of love. I would do this book an injustice, however, without mentioned my absolutely favorite character, Randall Woodstone. Randall arrives in Shearing to collect the many pounds that Charlotte’s father borrowed on loan from the bank. Although he is easily dismissible at first glance, Randall soon continues to makes re-appearances in Charlotte’s life and their romance, though brief, is fitting for this time period. What I truly loved about his character, though, is that he embodies the qualities that I seek in a worthy romantic interest – loyal, intelligent, and respectful. Randall allows Charlotte free rein of her business, never interfering and only seeking to support her. Although my heart broke at the multiple hurdles they faced – not always together – I loved the progression of their relationship, from their realistic stumbles to their messy patch-ups. Bunce never allows us to view this couple through rose-tinted glasses, showing us the stark reality of their relationship and the strain of both the curse and hidden secrets, but our patience and love for these two pays off by the end. A Curse Dark as Gold, if it isn’t already obvious, is simply not one to miss. Although this novel firmly remains a re-telling of “Rumplestiltskin” – and a brilliant one, at that – it goes on to encompass so much more than merely that, from its history to its characters. It reminded me, very much, of Jennifer Donnelly’s A Northern Light. If you’re a fan of strong heroines, one who can’t necessarily fight to the death but ones who can stand up for what they believe in and fight – in any way they know how – for their families, then this book is for you. If you’re a fan of fairy tale re-tellings, especially re-imagined ones that only serve to better the original tale, then this book is for you. And, most importantly, if you’re a fan of courage, especially found in dark times, then this book is most definitely for you. Just take my word for it – Stirwaters is worth the visit; very much so. Keertana once again you have completely won me over with your gorgeous review. I am not a fan of re-tellings, particularly ones of books that I didn't enjoy when I was younger, I was never a fan of Rumplestiltskin, the story always use to creep me out. But A Curse Dark as Gold sounds absolutely fantastic. Also I absolutely love a book more so when it has a strong secondary cast! I love gothic stories and I didn't know this book but I'm definitely gonna buy it! I generally try to avoid retellings, but in this case, the combination of your glowing recommendation and my past experiences with William C. Morris winners pretty much guarantees that I'll read this. It sounds like a daring and skillfully written novel. I am very, very curious. Gorgeous review, darling. Your reviews are just magical. I'll just have to admit that for whatever book you write this wonderful review I'll have to read it. I mean I'm not really into anything gothic, not to mention chilling gothic and retellings are mostly miss for me, but I want to read this one badly. The writing sounds wonderful and I love when you keep reading just because it's beautiful and you cannot stop. Oh wow! I so need to read this one. I do like retellings and especially those that haven't really been retold a lot. I haven't seen too many Rumplestilskin retellings. You make this world sound like a magical place to be. I am adding it to the wishlist now! Oh wow, this sounds INCREDIBLE! I don't always like retellings but this definitely sounds like a winner to me! I'm adding it to the WL! Whoa! I completely missed this book, but it sounds fantastic. Love Gothic tales and fairytale retellings, and I'm very interested to see what this author does with Rumplestiltskin. I especially love to hear how much you connected with this heroine and also the romance. I know you like the achy ones, K! Thanks for putting this book on my radar. I've been intending to read this fairy-tale retelling for ages now. Your review has reminded me again how desperately I need to read it. Like you, I do love it when fairy tales are put into real historical contexts, when authors ask us to imagine a real life situation where and when these events could have occurred. Rumplestiltkin is not my favorite fairy tale either, but that also means I haven't read any retellings of it, so it will be interesting to read one, especially one as good as this one appears to be. Lovely review, Keertana! Keertana, you never fail to introduce me to new (and amazing) books! I have a thing for fairy-tale retellings, so this is definitely right up my alley. Thanks for sharing your awesome review, doll! Thanks for the kick in the pants, Keertana. Did you know that you can shorten your long urls with Shortest and get money from every visitor to your shortened urls.